The U.S. Navy on Monday awarded Bath Iron Works a $2.8 billion contract to build four guided-missile destroyers at the shipyard over the next five years. 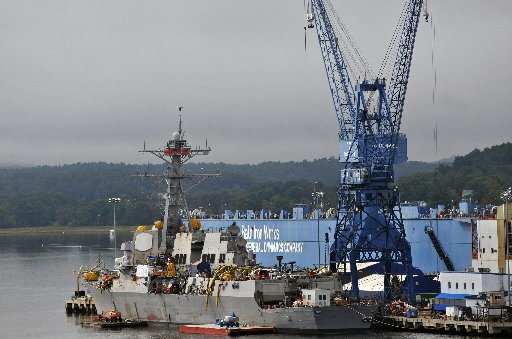 WASHINGTON — The U.S. Navy on Monday awarded Bath Iron Works a $2.8 billion contract to build four guided-missile destroyers at the shipyard over the next five years, providing some assurances to workers at one of Maine’s largest employers. Additionally, officials indicated that BIW would likely secure a fifth destroyer contract — valued at nearly $700 million — if the Navy can reach an agreement with Congress to cover a funding shortfall. The Navy announced design and construction contracts for nine DDG-51 Arleigh Burke-class destroyers through Fiscal Year 2017: four at the BIW facility owned by General Dynamics and five at Huntington Ingalls Shipbuilding in Pascagoula, Miss. Five DDG-51 ships are already under contract at BIW. Secretary of the Navy Ray Mabus said the competitive, multi-year contracts “represent great value to the taxpayer” while supporting both the needs of the Navy and the shipyards. Maine Sens. Susan Collins and Angus King both predicted that the additional ships will add stability to BIW’s workforce but expressed disappointment at the funding shortfall, which was created by Congress’ failure to reach accord with the White House on an alternative deficit reduction plan. “Haphazard budgeting processes, like sequestration, only serve to hamper our nation’s economic health and military readiness,” King said in a statement. With roughly 5,400 employees, BIW has among the largest private workforces in Maine and supports thousands of subcontractor jobs beyond the shipyard itself. BIW has built more than half of the 66 Arleigh Burke-class destroyers purchased by the Navy since 1985. Measuring more than 500 feet long, the destroyers have a crew of 276 and are equipped with an array of missile, torpedo and machine gun systems plus two fully armed helicopters, according to the Navy. In addition to the DDG-51, the Bath shipyard also has Navy contracts to build three DDG-1000 Zumwalt-class destroyers. Dan Dowling, president of the Local S6 unit of the International Association of Machinists and Aerospace Workers union at BIW, said he hoped that Monday’s announcement would put an end to “the waiting game” that workers have felt in recent years. While the breakdown of how many destroyers each shipyard would receive was unknown, the Navy’s announcement of 10 new ships was no surprise. Congress had directed the Navy to move forward with a 10-destroyer building plan. The final ship remains stuck, however, in the quagmire created by the across-the-board “sequestration” budget cuts that began March 1. Assistant Secretary of the Navy Sean Stackley told senators in early May that the Navy was roughly $300 million short for the 10th destroyer. At the time, he expressed optimism that the Navy could work with Congress to secure the funding. Collins, King and Maine Rep. Chellie Pingree, whose 1st District includes Bath, pledged to continue working to do just that on Monday. The new contracts provide some measure of predictability — and job security, workers hope — at the Bath shipyard at a time of considerable budget uncertainty in the defense industry. They also come roughly five years after Navy officials abruptly cancelled plans for additional DDG-1000 destroyers, some of which would have been built in Bath. Designed to be a “stealth destroyer,” the DDG-1000 Zumwalt-class destroyer was touted as an ultra-high-tech ship capable of operating close to shore. The Navy originally planned to purchase 32 Zumwalt destroyers and spent billions of dollars developing the ship. But the Navy ratcheted back the number as the program’s price tag mounted and concerns surfaced about aspects of the design. Then in 2008, Navy officials announced they were canceling the DDG-1000 program and, instead, planned to focus once more on the DDG-51. BIW received the contract to build all three of the DDG-1000 ships authorized by the Navy and Congress, although the vessels’ massive deckhouses are built in another Ingalls facility in Gulfport, Miss. The first DDG-1000 is expected to be completed in Bath later this year. The Navy’s decision to divide the DDG-51 contracts between BIW and the Pascagoula facility is, in part, an attempt to maintain some economic competitiveness in the industry. But politics and the unpredictability of Mother Nature are also at play. The congressional delegations of Maine and Mississippi have worked together in the past to scuttle attempts by the Navy to award contracts to a single shipyard. Hurricane Katrina, which caused widespread damage along the Mississippi coast, also prompted Navy officials to rethink a 2005 proposal to sole-source the contracts.